Mountain Resort Cabin Rentals - Red_Feather - GA - Vacation Rentals in the North Georgia Mountains. 4 bedroom, 3 full bathrooms, 1 half bathroom. Sleeps 20 guest. River Front and Spacious 6 Bedroom, 3-1/2 Bath Cabin Located in Ellijay, Georgia Inside the Coosawattee River Resort. 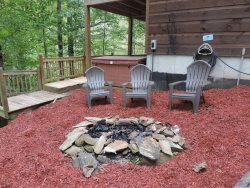 Red Feather is a large 3 level, 4 bedroom and 3-1/2 bath cabin located in The Coosawattee River Resort. There is a fully stocked kitchen with a counter bar and 2 bar stools. The dining area is adjacent to the kitchen. The dining table will seat 6 comfortably. Double doors lead from the dining area to a covered deck complete with hammock, outdoor fireplace, table and chairs as well as a gas BBQ grill. The living room is open with a Queen size sleeper sofa, a reclining chair and oversize chair with a wood burning fire place and flat screen TV. There is a half bath just off of the dining area on the main floor. The master bedroom is on the main floor with a King sized bed, dresser and 32'' flat screen TV. The master bathroom has a walk in shower, double sinks and a jacuzzi tub. The loft has a Queen sleeper sofa, a desk and wireless internet. The 2nd bedroom is upstairs with a Queen bed and dresser. The 3rd bedroom is upstairs with two full sized beds. There is a 2nd full bathroom in the upstairs area. The 4th bedroom is downstairs with 2 full beds, a dresser, and TV for video games. There is a 3rd full bath downstairs. The game room is downstairs with 2 full sized sleeper futons, a 46'' flat screen TV, pool table, dart board, foosball table and card table for games. Off of the game room is a covered lower patio with a hot tub and table and chairs. There is a fire pit as well. * Rental Rate is based on up to 4 guests. Each additional guest is $10.00 per night per person plus tax. GUESTS MAKING A RESERVATION MUST BE AT LEAST 28 YEARS OLD. BY SUBMITTING THEIR RESERVATION THEY ARE CONFIRMING THAT THEY ARE 28 YEARS OLD OR OLDER. NO LARGE GROUPS OF GUESTS 28 YEARS OLD AND YOUNGER. THE MAXIMUM IS 6 GUEST WHO ARE UNDER 28 YEARS OLD IN ANY CABIN UNLESS PRE-APPROVED PRIOR TO BOOKING. * Minimum of 8 extra (adult) guests for all Major Holidays. Total of 12 Adults.